Thank you to the hundreds of families who participated in last week’s Commitment Weekend! We are humbled by the extreme generosity and many blessings of our community. Thank you for your investment in our bright Catholic future! Many of you told us that you are still prayerfully considering your campaign pledge. We will be accepting donations throughout the Easter season. Don’t forget to review the list of available naming opportunities! During Commitment Weekend, March 12th – 13th, you will have the opportunity to pledge at all Masses. With almost 75% of our $3 million goal already raised, success as a parish is within reach! Read the materials you received in the mail or from a volunteer. Pray with your family about your gift to the campaign. Pledge your 5-year commitment during Mass on March 12th or March 13th . Pledging over time lets donors make a bigger impact within their household budget. For instance: Peter and Jane are asked to consider a pledge of $6,000. Peter and Jane do not have $6,000 on hand. But after prayerfully considering their finances throughout a five-year period, they found a way to work within their means to allot $20/week ($80/month) for the next five years to the campaign. Although it’s less than the $6,000 request, they feel great about being able to give more than they thought they could! A small daily sacrifice can add up to a big impact for your parish! PLEASE VOLUNTEER FOR OUR CAMPAIGN! 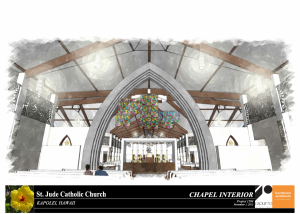 The St. Jude community is a reflection of its mission of worship and service. So many of us draw strength from and are inspired by working in a parish with such a long and historic commitment to service and building our community. We are what we are today because of what we have invested in it – our time, talent, and treasure. To be successful, the Building Hope & Community for Generations campaign will call on each of us to sacrifice what we can, as so many before us have done for our benefit today. 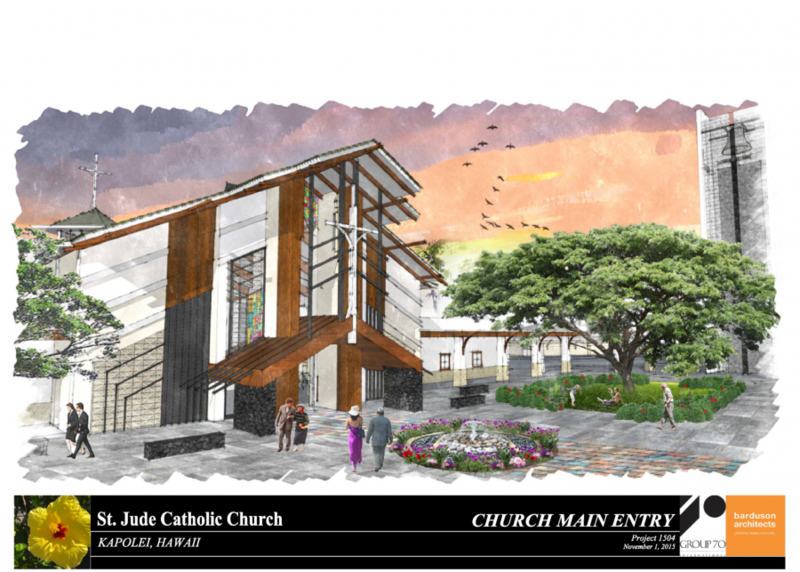 This $3 million campaign will provide the funds to make a necessary investment in the growth of our parish and the many facilities in which we all congregate to minister and serve. Our early parishioners – including many of you here today – worked for decades to raise the needed funds to purchase the land and build the church in which we now sit. From Huli chicken sales, carnivals, luaus, stew dinners, and bake sales, the St. Jude community has a tradition of coming together in service of the Lord. In the years since our facilities were built, we have invested so many resources in building the fabric of our community. Today, we face a similar need, and we need your help to meet it. Help us spread the good news! Over the next few weeks we will be calling hundreds of parishioners to raise awareness for the capital campaign, answer questions about the projects, and assist with taking pledges over the phone. Please keep in mind, this website is a work in progress. There are a few features or elements of the site not yet available because we are in the progress of getting more content. With time, you will see this site flourish and become one of the many resources for the Capital Campaign. If you find any typo’s, grammatical errors or something technically not right, please email [email protected] and we’ll look into it right away.